That’s a nice interest-rate spread for the federal government, which currently pays historic lows of about 1.5 percent on 10-year U.S. Treasury Bonds and 2.5 percent for 30 years. Even taking into account the sky-high default rate on student loans, is 6.8 percent a fair price for recent graduates to pay? 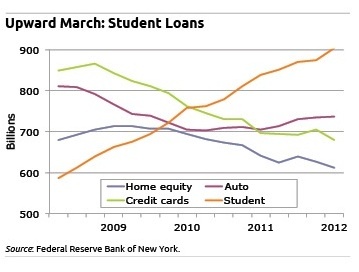 Yes, many college students may be guilty of borrowing more than they need. The average student’s debt exceeds $18,000, according to finaid.org. But it’s not difficult to find students who owe $60,000, $80,000 or more. And yes, they’re well-educated and have loads of energy – everything they need to succeed. Throw them into the water and they probably will learn how to swim. But we are talking about 18, 19 and 20 years old just a couple years out of high school and with little experience in the full-time labor force, much less interpreting tricky loan documents. “My life has become a daily swim in a tar pit with very little hope of ever getting out,” Nick Keith said recently on dailyfinance.com. Keith appears in the film, “Default: The Student Loan Documentary, which was funded in part by $2, $5 or $10 contributions by students and former students, according to producer Serge Bakalian. And yes, parents should be smarter about keeping their kids – and themselves, as co-signers – out of the debt morass. But we don’t need to go over the abysmal state of adult financial literacy. And there is no escaping the debt for those who borrowed more than they can afford to repay, based on their first job or career path. Nearly 1.4 million other Americans discharged their debts by filing for bankruptcy protection in 2011, but that option is barred under U.S. law for student loans. No mistakes allowed. Part of the debt collection system, Bloomberg News recently reported, is the little-known but highly profitable business of “guaranty agencies” that collect on the government debts by garnishment of former students’ wages. Finally, the toll of high debts can be emotionally devastating for some students, as I wrote in a 2011 report about personal finance instruction in U.S. colleges and universities. Should that be a consideration in determining whether policymakers, colleges, and financial institutions are able to come together and agree on a meaningful fix? To watch the entire “Default” documentary, co-written by Bakalian and Aurora Meneghello, for $1.00, click here. 3 Responses to College Loans: A Punitive System? It is certainly a big burden, especially for parents. I wish the government had a clear plan to ease or lighten the burden for kids to study. Perhaps the real issue isn’t so much loans as costs. Not everyone needs to go to college, or go for 4 years, or take art history, or be on the football or cheerleading team. Let’s focus post-high school education on giving students the skills and credentials they need in the real world to earn a living, and let’s do it in the most cost-efficient method possible (like online courses supplemented by on-campus focus sessions). Then let people figure out the most effective way to pay for this education. Of course, first required course for all freshman: Consumer Finance 101, starting with an understanding of the magic (or black magic) of compound interest. Second course: Consumer Economics, because apparently someone still needs to inform students that there is no such thing as a free lunch. While it may be too late to help students who have run up large loan balances, some solid financial underpinnings for future students is probably a necessity. In yesterday’s Washington Post there was a story about an auto running into a building. The interesting part was that they interviewed a summer intern working in DC who was having dinner at Morton’s Steak House on the floor above where the accident occurred. My wife and I, who are well off, don’t even eat at Morton’s because it is too expensive. Or the call I received from one of my tax clients about whether her son could write off any of his living expenses for his summer job. She was particularly concerned because she had to supplement his salary, because it didn’t cover his living expenses. Much to my surprise, he made $12,000 in his summer job. Only two stories, but I have many more about students who are clueless about finances. There is a clear need for financial education for prospective students.